If you like oysters, then the odds are pretty darn good you’ll be satisfied at most places with “oyster bar” in the title. 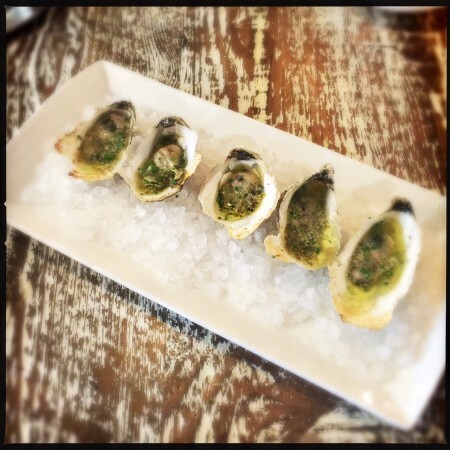 Rappahannock Oyster Bar in the Cigar Factory on East Bay is no exception. 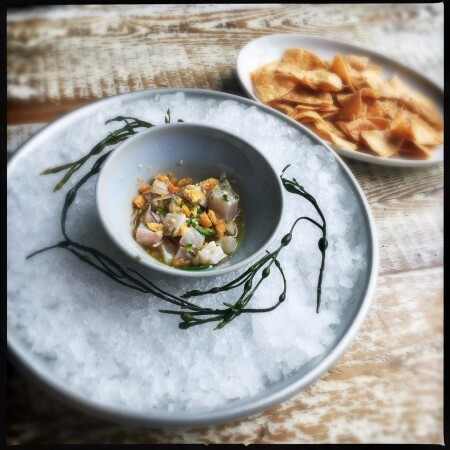 Offering five or more varieties shucked to order and served atop freshly fallen snow-like crushed ice, this is the way to a bivalve lover’s heart. Happy hour makes the seduction even sweeter, with $1 and $1.25 options amid a lively crowd in bright, upscale surroundings. The restaurant is part of a group of restaurants, a store, and an oyster farm, based in Richmond, Va., and the practiced polish — not to mention the exceptionally fresh products — speak for themselves. Still, the most remarkable thing about Rappahannock Oyster Bar is that the oyster bar isn’t the thing. 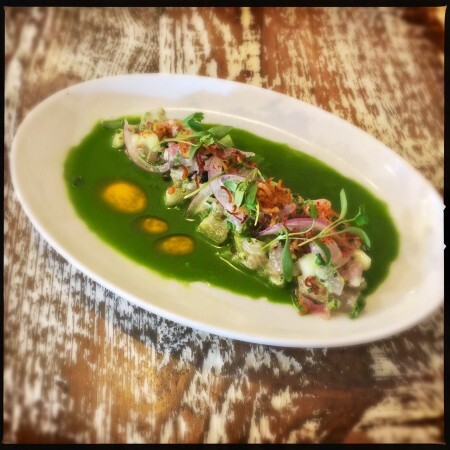 The national dish of Peru, Rappahannock’s raw bar ceviche ($16) is as good as anything you’d find south of the equator. Loaded with tons of fresh mahi mahi, sheepshead, and hog snapper chunks, it’s a pleasure as much as it’s a surprise to encounter a ceviche that isn’t half unnecessary filler. Made with orange juice, jalapeño, and thin strands of onion, I could have stood more heat, but those with delicate palates will appreciate the restraint. The grilled oysters ($15) with smoked jalapeño butter are also lacking in any discernible heat and mostly taste like butter. A little bit gritty and a lot boring, if for some reason you feel inclined to force someone that hates oysters to eat oysters, this would probably be the way to do it. Accompanied by a small apothecary-style dropper of delicious, homemade hot sauce (at last! ), get some of that exceptional hot sauce and skip these. But the American red snapper tartare ($16) is unique and truly sublime. It lists cilantro, ginger, and yuzu among its ingredients, but the addition of tiradito sauce renders it Peruvian far more than Asian. The cilantro-heavy sauce is refreshing and the overall dish quite green in flavor, yet still light. Tiny bits of cubed cucumber, thinly shaved onion, and crisply fried shallot add texture against the tender fish. I’m not sure I’d go quite that far, but fans of the traditional sandwich will likely be pleased. 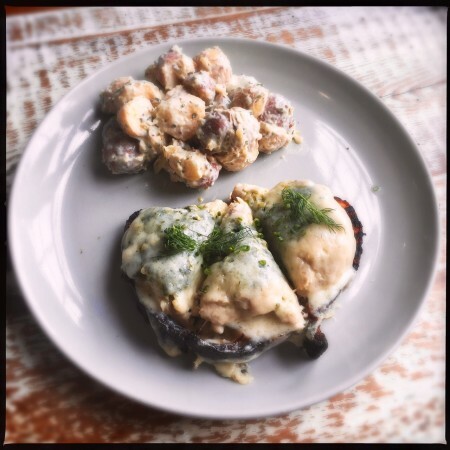 Served open-faced on a thick, soft bread and topped with dill and a mellow havarti, the predominant flavor is that of the rich confit tuna. The accompanying potato salad features al dente peewee potatoes. I don’t normally give a rip about potato salad, but this light, citrusy variation made with mustard seeds and chives is next level. 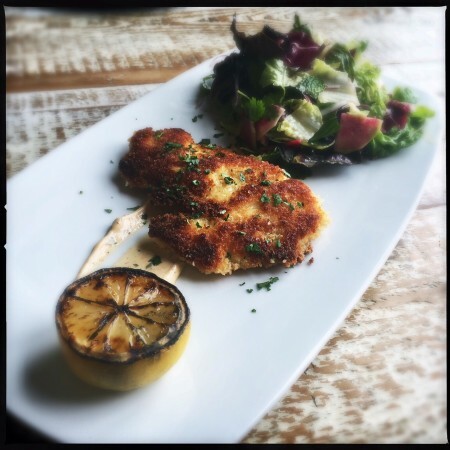 Also offered at lunch, the fish Milanese ($18) is simple, as it should be. Mild wreckfish is panko-crusted and pan-fried to a golden crisp. Served with a smear of spicy remoulade and an ample, radicchio-laden salad with a lemony dressing, it’s pleasant but forgettable. The dinner entrees are truly where it’s at. I don’t know what I did right in a past life to be recently rewarded with so much extraordinary charred octopus ($23), but this is living. Perfectly cooked — tender with a pleasing char — the octopus is dusted with parsley and served with three unexpectedly delightful fried elephant garlic slices. The accompanying potato pave is an expertly crafted piece of art, but a bit bland. The meat itself is plated upon well-balanced swirls of romesco and dots of a yellow horseradish-infused sauce. It’s a dish that is almost as lovely to look at as it is to eat. The grilled cobia ($26) is also exceptional. Firm, yet flaky with a strong char and a bright asparagus chimichurri on top, the two filets are plated on a bed of yellow turmeric-infused sauce. Spicy shishito peppers, chunks of al dente summer squash, and bright green butterbeans render this fresh and truly unique. I can’t quite pin down a cultural or regional inspiration, which leads me to conclude it’s as innovative as it tastes. Lastly, the seared diver scallops ($25) are another interesting take on a seafood classic. Lightly seared and remarkably tender, the medium rare scallops are served on a smooth, house-made corn pudding. Meaty Maitake mushrooms add some toothiness, while a grilled corn and hot pepper relish packs some real heat. The fiery contrast in flavor and textures contrast perfectly with the mild scallops and sweet corn purée. It’s like eating a plate of summertime. 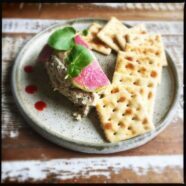 With many high notes, a lovely interior, and excellent service, I’m not telling you how to live your life … But you aren’t living your best life if it doesn’t include Rappahannock Oyster Bar.